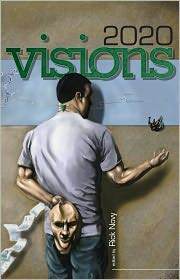 It's a few months later than planned, but we finally have an .epub-format ebook version of Rick Novy's 2020 Visions available as a Nook Book at Barnes and Noble, and directly from M-Brane Press as well (details below). It's our hope that people who passed on the lovely print version of the book (also available at B&N as well as Amazon) were just waiting for a version that they could read on their Nook or iPad or a variety of other devices and will now go ahead and get a copy of this great book. 2020 Visions is a beautiful original anthology of very near-future speculative fiction (the "2020" in the title refers to the year) featuring stories by Mary Robinette Kowal, Alex Wilson, Jack Mangan, David Gerrold, Emily Devenport, Alethea Kontis, Ernest Hogan, Jeff Spock, David Lee Summers and many others. This is a very cool book, and for only $4.95 at Barnes and Noble, it should not be missed. You can also buy it right here for only $3.95, using the Pay Pal button below (takes credit cards and e-checks if you don't have a Pay Pal account). One may wonder why we seem to be undercutting our own price at Barnes and Noble. We're really not--it's just that direct purchase from M-Brane means a bit more money more quickly that can eventually go to the authors when this book goes into profit. But if you're shopping at B&N anyway, then by all means get it there. By the way, if you purchase it here, allow anywhere from a few hours to a day or so for delivery: we're not rigged for direct download from this site, so we send a link to you by email. One last special detail: Anyone who buys 2020 Visions in any format (print, Nook, Kindle) from B&N, Amazon or directly from M-Brane Press will get a free subscription to the electronic (PDF) edition of M-Brane SF, our very nice monthly magazine of short speculative fiction. If you purchase from B&N or Amazon or any other retailer, just forward a copy of your order confirmation or receipt to mbranesf at gmail dot com, and we will add you to the M-Brane SF subscription list.